A very interesting film chronicling not only this man and his techniques, but also the history of creature feature special effects. This is a pretty cool documentary about the man who pretty much invented creature special effects. here’s a guy who basically made puppets, only instead of moving them and filming it, he came up with a technique to keep them still, treat it like animation, and only move the film through a projector, like a flip book. the results are pretty amazing. the movie gets into his process, although it doesn’t quite spend enough time on that. instead, it moves pretty quickly to ray’s films and to the directors he influenced. the parts about his process are definitely the most interesting. the movie loses some of its steam after it moves away from that, but it’s still enjoyable listening to some of the modern great directors talk about how Harryhausen’s films led to some of theirs. ray Harryhausen is the first real mastermind in creature effects. before him, putting a man in a costume and covering him with makeup always did monsters. Harryhausen was the first guy who realized that there were other ways. It started when he saw the original classic, King Kong, and noticed that this giant monstrous gorilla was really just a man in a suit. Harryhausen then began making his own miniature creatures and figuring out how to put them on film. the technique that he came up with is called stop-motion animation. the process is just like regular animation, (running still images of hand drawn designs through a projector so fast that the images start to move), or rapidly spinning through the pages of a flip book to watch the images come to life. Harryhausen would make a metal skeleton for a creature that could move in every way Possible. that’s the reason for the metal inside, in order to give the creature maximum flexibility. he then would design the outsides of these creatures and paint them with elaborate detail. now it was time to put it on film. this was the most interesting thing about his technique. Harryhausen would set the creature up in a certain Position and take a snap shot. the camera lens would open, take a shot, and then shut. now Harryhausen would move the creature a tiny bit. maybe he would move an arm or a tail just a little. then he would take another snap shot. this would go on until he had enough movement for a scene. when the film was run fast through a projector, it looked as if the creature was really moving. 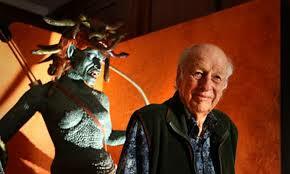 the documentary, ray Harryhausen: special effects titan, details exactly how ray did all this. I really like that it gets into his process and not just the works that he was able to create with it. in fact, I would have liked to see even more of how he did it all. sure, we get the explanations, but how about an even in more depth look at the materials he used. how did he get the idea to use these metal pieces to make a skeleton? what material did he use for the outside of the creature, for the flesh and skin? how did ray come up with this idea to begin with, and figure out that it could be done this way? these are questions that the movie never really answers. instead, the film becomes about two things. 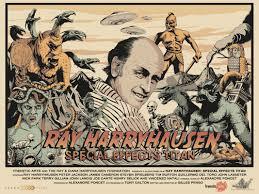 the films that ray made, and Harryhausen influenced the film directors of today whose works. if the first part of the movie is about Harryhausen’s process, then the next three quarters are about his career and his influence. more time should have been spent on his process, watching the man work and understanding how he was doing it all. when we start getting into his movies, we see a bunch of black and white monster films. we see movies that influenced Godzilla and Jurassic Park, among others. one of ray’s early films involved a giant octopus that came out of the water of the San Francisco bay and attacked the golden gate bridge. there are some funny stories to how this monster came to be and the problems they had, including the reason why the monster only has six legs and not eight, and why we never see all six legs at the same time. another funny story involves the reasons why the people in charge of The Golden Gate Bridge in San Francisco weren’t happy with what ray was doing, fearing that people might really believe the bridge was unsafe from monsters in the sea. soon, ray was going on to make bigger and better things, including flying saucers which he had to suspend from the air, using strings to hold them up. after his first four movies or so, ray realized that he had destroyed four major cities of the world. he had destroyed New York in his first film, and then san Francisco, Washington D.C., and finally Rome. at this Point, Harryhausen was looking for something else to do, and so he turned to making mother goose nursery stories with his puppet work, and also to bringing to life stories of legends and mythology. this is also where ray’s movies start to be made in color, and where he achieves real, well-known success. Some of ray’s biggest movies were the seventh voyage of Sinbad, Jason and the Aragonaughts, and Clash of the Titans. Jason and the Aragonaughts, in particular, will always be known for it’s skeleton fights where seven skeletons wielding swords come after and attack a bunch of men, all fighting at the same time. it’s one thing to move one dinosaur around the screen, but these skeletons all moving at once, are pretty amazing. the modern day filmmakers who this movie got to be interviewed are all pretty fantastic. I loved hearing about the ways that they were influenced, including James Cameron giving Harryhausen credit for the way the metal skeleton of his terminators turned out. Spielberg is also a major player in this movie, discussing how he brought Harryhausen into the studio to see what they were doing with the dinosaurs of Jurassic Park. There are plenty of great names involved in this movie, including peter Jackson and Guillermo del torero, but the one who is mysteriously missing is George Lucas. Maybe that’s because this movie is so down on computer effects, and that is basically what Lucas pioneers and specializes in. I like the way the movie takes a stand against computer effects and how fake they look. it would have been cool to see a split screen comparison between something done in a movie for real and something done all with computers. Maybe a comparison between the car chase in The French Connection or Ronin, and one in the fast and furious or transformers movies. I always think about the way Christopher Nolan flipped a truck over for real in The Dark Knight, and then Brett Ratner just used computer effects to it in x-men III, and it looked incredibly fake. while there are Points like this that the movie never gets into, and others, such as Harryhausen came up with his ideas to begin with, it is still a very interesting and detailed film.